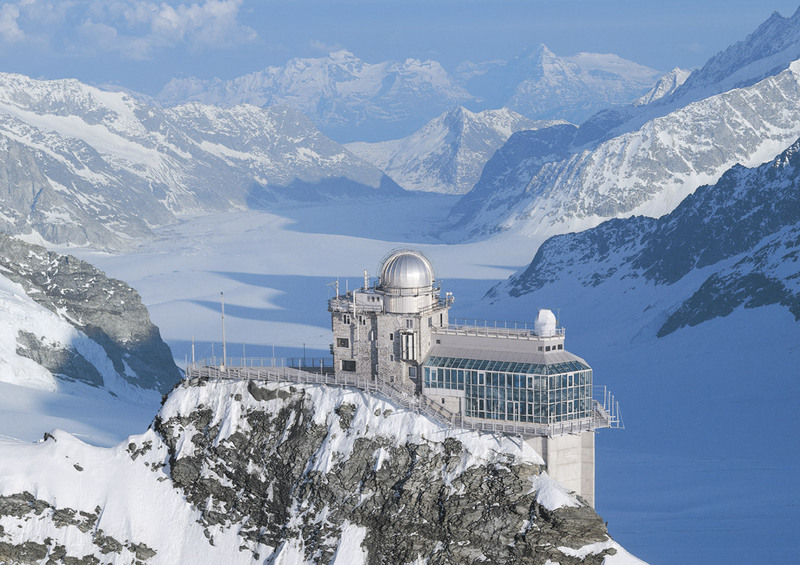 The High Altitude Station at Jungfraujoch (46°33´N, 7°59´E) is widely recognized as an important research site because of its unique location, its year-round accessibility, and an excellent infrastructure. The research station is situated at an altitude of 3450 m above sea level, between the peaks of the Jungfrau (4158 m a.s.l.) and the Mönch (4099 m a.s.l.). A second research location, the Sphinx laboratory (3580 m a.s.l.) was constructed in 1937. Because of its altitude, the station is mostly in the free troposphere and is quite insensitive for ground-based pollution sources. The sampled air is therefore representative for the atmospheric background mixing ratios of many constituents which are monitored by several research groups. The infrastructure and support for scientific research are provided by the International Foundation High Altitude Research Stations Jungfraujoch and Gornergrat (HFSJG) which was founded in 1930. Since 2000 the Climate and Environmental Physics division of the Physics institute of the University of Bern, takes air samples on a regular basis for analysis of CO2, ΔO2/N2, δ13C and δ18O on CO2. Since 2004, the ambient mixing ratios of CO2 and O2 are also monitored quasi-continuously at the Sphinx laboratory. The objectives of these measurements are to monitor the background CO2 mixing ratios, which have been increasing significantly since the start of the industrial era, and to gain knowledge about the partitioning of CO2 among the main reservoirs: the ocean, the atmosphere and the land biosphere. Furthermore, 2-weekly integrated samples of 14C which can be used as an indicator for the fossil-fuel based CO2, is monitored by the university of Heidelberg since 1986. Other research at Jungfraujoch include: aerosols, meteorological parameters (e.g. temperature, air pressure, solar radiation), O3, NOx, cosmic radiation, 7Be, 10Be, 85Kr and permafrost monitoring. For more information about the research at Jungfraujoch see: www.hfsjg.ch/reports. Presently, our measurements are funded through ICOS-CH, the Swiss contribution to ICOS-ERIC. Formerly, they are supported by the Swiss GCOS office. The Global Climate Observing System (GCOS) is an initiative of the World Meteorological Organization (WMO), the Intergovernmental Oceanographic Commission (IOC) of the UNESCO, the UN Environmental Programme (UNEP) and the International Council of Science (ICSU). GCOS is designed to ensure that the observations and information needed to address climate-related issues are obtained systematically and made available to all potential users. In particular, GCOS responds to the objectives and requirements of systematic observation as specified by the UN Framework Convention on Climate Change (UNFCCC) and the Kyoto Protocol.